Alexandra Solovieva, currently Chief of the External Relations and Communications Section at UNV, served as a UN Volunteer early in her career, then progressed to different postings with the United Nations Development Programme. Alexandra shares her insight on how volunteerism impacted her journey. 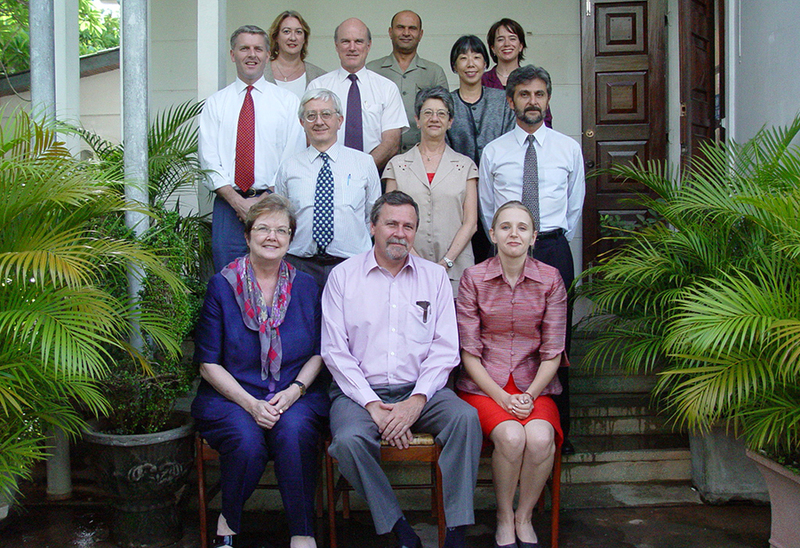 Former UN Volunteer Alexandra Solovieva (Russian Federation, front row, left) with the UN Country team in the Lao PDR, including the Resident Coordinator/Resident Representative, Finn Reske-Nielsen (centre, front row). UN Volunteers serving in key UN offices and functions, supporting national institutions from central down to village levels, we also strove for better conditions and recognition of our professional contributions. I recall a visit from our late Deputy Executive Coordinator, then Executive Coordinator Ad de Raad, who has been a figure with vision and an influence on us all. I had a very interesting assignment as a UN Volunteer. What’s more, it resonates strongly with the current juncture of UN reform effort. As the head of the Resident Coordinator’s Office in the Lao PDR, I supported two subsequent UN Resident Coordinators and sixteen different agencies and Bretton Woods Institutions. The task at hand was to roll out the nationalization and implementation of the Millennium Development Goals (MDGs) and mobilize the UN country team and partners around the new agenda. It was also to prepare the first UN development assistance framework truly grounded in national priorities and the MDGs. As a UN Volunteer, I travelled to Kazakhstan to share experience and help with the common country assessment. I never missed a single UN Country Team meeting in four years, providing support to coordination processes. My RCO assignment had a clear meaning, connecting top planning and policy-making levels of UN support and frontline reform to issues faced by people. I gained aggregation and system thinking skills, humility and trust in growing national capacities. The core strength of volunteers comes from their motivation. The early 2000s were the years of charting the course on the MDGs, experience we now build on for the SDGs. Many first times for the UN and government in countries like the Lao PDR: first website, first database, first GIS mapping of UN projects. When we lacked perfect tools and guidelines to get us there, we created them ourselves. It’s nearly 20 years later that we credibly judge the progress made. Behind development effort are people from village to top government, and from UN teams to UN Volunteers. From UN Volunteer, I was selected to the UNDP leadership programme. This was followed by service in headquarters, regional and country-level positions, including as Deputy Country Director in India. This is when, with the Ministry of Youth Affairs and Sports, we started UNV's largest volunteer infrastructure project, with the NSS/NYKS youth project in India. Fast track to 2014, it was my time to give back to UNV by assuming the job of Chief Programme Coordinator in Bonn. I led UNV global programmes and newly-created regional offices. The challenge was dual: first to create a system's base for results achieved by volunteers, which extended to developing volunteer solutions to the SDGs. Second to decentralize UNV's presence closer to action. In doing so, a huge emphasis was placed on South-South and people-to-people cooperation, and on the role of new and (re)emerging partnerships. I pushed UNV to try new approaches. Not all of them were adopted or worked successfully. But we took risks and took UNV out of the comfort zone. A number of projects showed convincing results or went to scale. I was particularly inspired by the youth employment project in Cambodia, Kakuma refugee volunteers intiative in Kenya and the UNV partnership with the Beijing Youth Federation in China. #NextGenUNDP and broader UN development system reform will place even higher demands on volunteers and UNV as a system-wide asset. We have an official, scientific definition of volunteerism. My definition is simple and that is to take responsibility. Alexandra is moving next as UNDP Resident Representative in the Republic of Belarus.